Minister Hakeem and Japanese Ambassador Akira Sukiyama during the discussions. 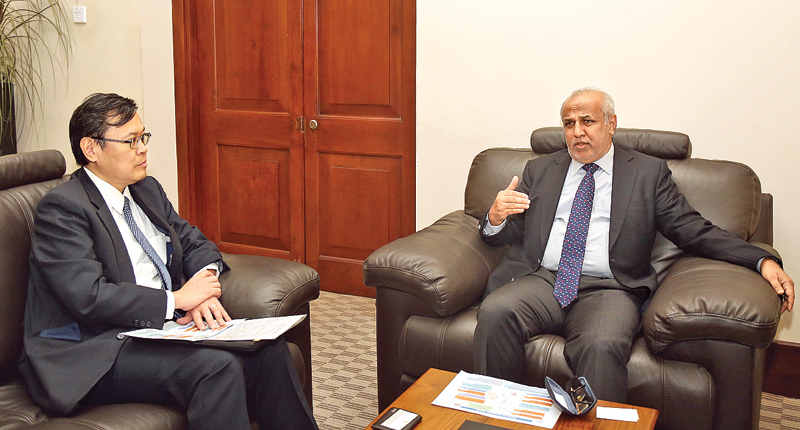 Sri Lanka Muslim Congress Leader and City Planning, Water Supply and Higher Education Minister Rauff Hakeem met with Japanese Ambassador to Sri Lanka Akira Sukiyama at the Higher Education Ministry on Tuesday. At the meeting, they discussed the water supply and sewerage projects carried out with the Japanese aid in Sri Lanka. The discussion included matters related to the water supply scheme for Anuradhapura - North, expansion of Kalu Ganga Water supply Scheme, Jayewardenepura sewerage system management and Kilinochchi water supply scheme rehabilitation and sewerage project. The Ambassador invited Minister Hakeem to participate in the seminar scheduled to be held in Colombo next month on the usage of water containers manufactured with the Japanese technology. Further, matters relating to Sri Lanka - Japanese cooperation on the higher education sector were also discussed.